In 1886 a young man began selling watches to supplement his income as a railroad station agent. He did so well that less than a year later he was able to quit his job and sell mail order watches and jewelry full time. 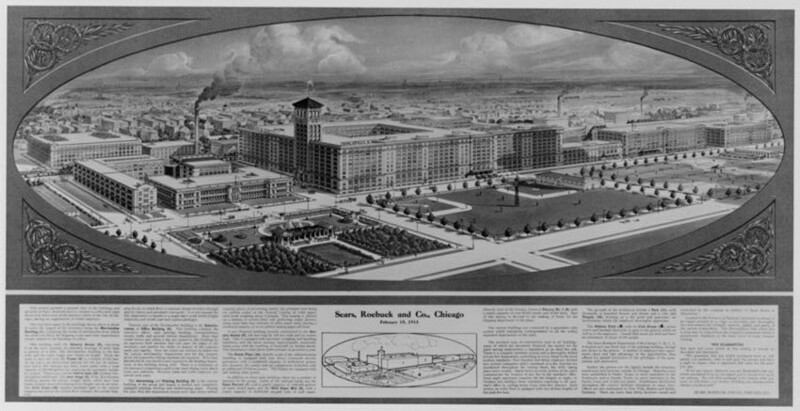 In 1893, after acquiring a partner, he established the corporate name of Sears, Roebuck and Company. 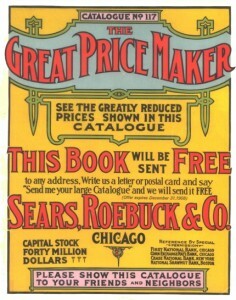 The first Sears catalog was only thirty-two pages and grew steadily to 1100 pages by 1908. What made this catalog so successful that it became known as “The Wish Book”? America of the 1890’s was primarily rural with 64.9% of the population living outside of major cities. The Wish Book supplied implements for farmers and tradesmen of all kinds, all delivered to his hometown railroad station. A farmer could order everything from agricultural implements to wagon wheels. An aspiring musician could order a wide assortment of instruments, including pianos! There were charts on how to order eyeglasses and size rings. A rural housewife could break the monotony of endless miles of beige wheat fields by ordering a hand decorated China set which came in such “rich and brilliant” colors as “royal purple, crimson, sapphire blue, emerald green, and topaz” for $3.85. An ambitious man could even order plans and all the materials to build his own home, right down to the nails. There were no televisions or radios. The telephone was in its infancy. The Wish Book was as much entertainment as it was a necessity. It had lengthy descriptions and instructions with each product, and most of the items sold by mail order were not available locally. People read and worked, and dreamed of acquiring what they saw in the Wish Book. Those early Wish Books now sell for up to $250. For those of you that just want to take a glimpse at the past, reprint catalogues are common with used copies available through most on-line book sellers for under $20. They are very useful sources for dating your antiques. Plan on paying more for original “Wish Books” in good condition, from $85.00 and up. Sears closed its catalog division in 1993. It was expensive to produce and most people now lived in the city, so the importance of The Wish Book had was almost gone. It seemed like the end of an era. Then came the Internet and we suddenly had e-commerce, e-mail, and of course e-catalogs. Sears is once again offering mail-order items; this time, through on-line catalog sales, along with thousands of other businesses big and small. Over one hundred and twenty-five years later and you can still read, wish, and dream. 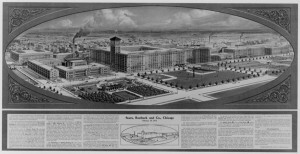 Below is a panoramic rendering of the Sears, Roebuck, and Company plant in 1939.